Mixing fluids can be very important in the design of miniaturized chemical and biochemical analysis systems. However, the mixing of fluids at the micro-scale is challenging because of an inherent lack of any mechanism to induce the mixing. Turbulence is a good natural way to cause mixing, but microfluidic processes are laminar in nature. In a previous blog, I discussed the challenges that arise because of the laminar flow regime and how one might try to overcome the challenges by modifying geometry to induce mixing. In this blog, I will discuss our work on further optimizing the microchannel geometry using the design optimization software, CAESES®, from Friendship Systems GmbH. The image below shows a microchannel with two inlets and an outlet. Two different fluids enter the inlets and are supposed to get mixed as much as possible before leaving the outlet. The geometry needs to be modified to increase the mixing of the two fluids within 0.05 sec. There are nine variables that are allowed to change during the geometry optimization. 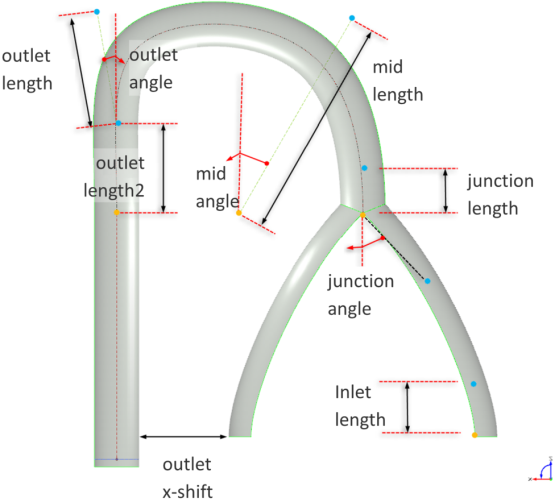 Design constraints are enforced during optimization for practical reasons such as keeping the cross-sectional shape and area constant, fixing the inlet positions and vertical location of outlet and keeping the main channel length under 2.5 mm. where C is the concentration of any of the fluids at the outlet and <.> means the average of the quantity inside. means 100% mixing and means no mixing at all. Therefore, the objective of the design optimization is to bring the value of as close to zero as possible. CAESES is a powerful optimization tool which can be used for 3D parametric modeling. The animation below shows CAESES performing design optimization to the microchannel geometry. A fully-parametric model of the microchannel was created and the optimization study was conducted in CAESES. 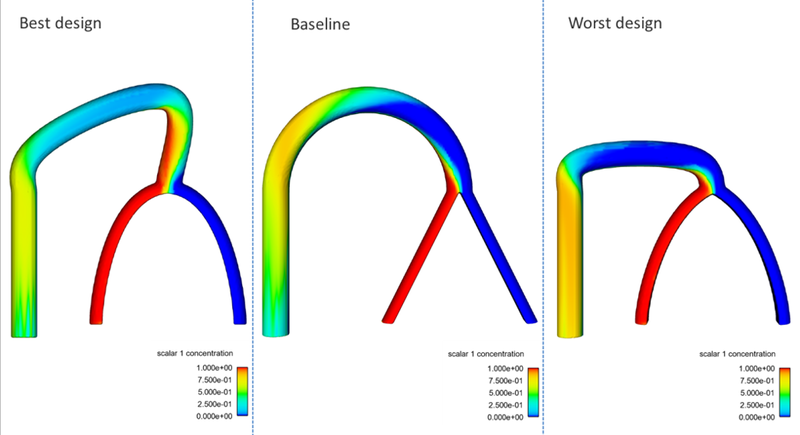 A design of experiments with 150 design variations was run, and the best design was fed to another high accuracy optimization algorithm within CAESES for further design improvement. The objective function for the mixing showed an improvement of around 8% from the baseline design ( ) to the best design ( ). This image shows the comparison of design shapes obtained from the optimization study. Significant differences can be noticed between the baseline (starting design) and the best design. For exact quantitative differences between the best and the baseline design, I have added a table of comparison below. Whether performing a parametric study for sediment scour, a microchannel geometry optimization, or a metal casting part (that I will discuss in a future blog), design optimization has many applications. FLOW-3D’s seamless integration with CAESES offers a powerful solution for optimization studies in a very hands-off manner, saving time and producing better designs. Feel free to contact me at adwaith@flow3d.com to find out more about our optimization capabilities in collaboration with CAESES.